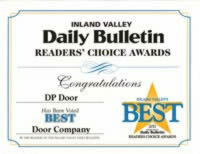 "Hooray for a locally owned door business as they have the best choices, service and installation ever." "Excellent Service!! Terry is unbeliveable in his field. I have found a new door place for good. " "They did a great job and more importantly cleaned up after themselves. It's refreshing to have workers come into your home and respect it. Thank you DP Doors for a job well done!!" We also have "Barn Doors" and wardrobe closet doors for inside your home..
We have several brands of windows in vinyl wood and fiberglass. Of all of the brands we have used over the last few decades, Milgard is our most popular. We have two locations, one in Claremont and our main showroom is on the boarder of Rancho Cucamonga and Upland. 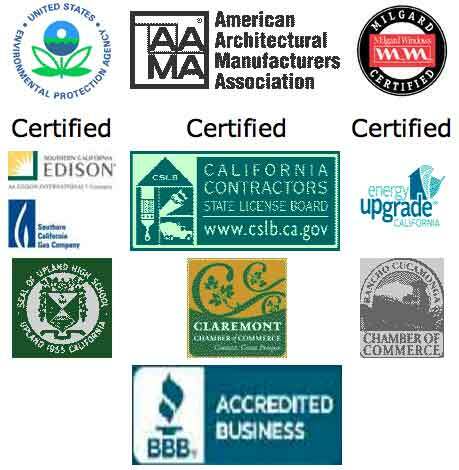 We are a certified HERO Contractor and can register you for the energy purchasing program. Here I have a lot of the catalogs we use at our showroom. There are more pictures of doors and catalogs in our store but I have several here. The catalogs include Wood, Fiberglass and Vinyl doors and windows. You'll find Milgard products here also. We happen to serve the same areas that I grew up in. First it was Claremont then Upland. My first home that I owned was in Rancho Cucamonga and now I live in Alta Loma. I haven't move far and our store hasn't either. We have been in the same Sunrize Shopping Center for 25 years. Trained by myself and other old guys who have been installing for DP Door for decades. that are installed by competent Professional. We are proud to have the best door installers and window installers in the area. Our installers are hired not only on their experience but their caring personality. we do is done in a workmanship way. Our buying power keeps our prices competitive and our quality is higher then the vast majority of others. D.P. DOOR COMAPANY, 2019 ALL RIGHTS RESERVED.